The blog that inspired me was Crafts4Lily, who got the idea from this blog, who I think got it from someone else. Hey, good ideas have a way of getting around, and this one, I LOVE! Mine are a little different because I liked them faceless, I just liked the look... and I wanted one with a kimono oufit (the red)... however, everything else was pretty darned spot on. 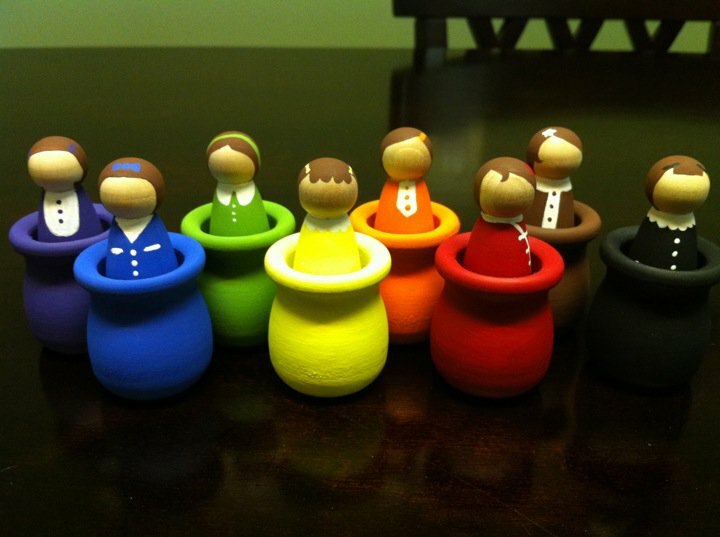 The wooden dolls and pots were from Joann's, painted with non-toxic acrylic paint, sealed with beeswax and olive oil polish. 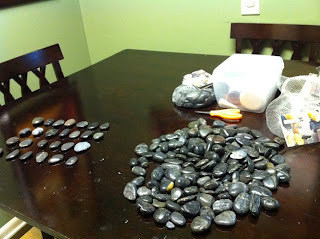 I am super in love with Pinterest and had seen a photo of rocks with a painted alphabet. My son, Kai, is just at the right age for something like that, so I wanted to make some painted rocks, but turn them into fridge magnets. I used pretty much the same process that I did with the wooden dolls as far as painting, sealing and finishing. I added the magnets to the back using E-6000 glue. I painted the front of the rocks with dots and put the corresponding numbers on the back. 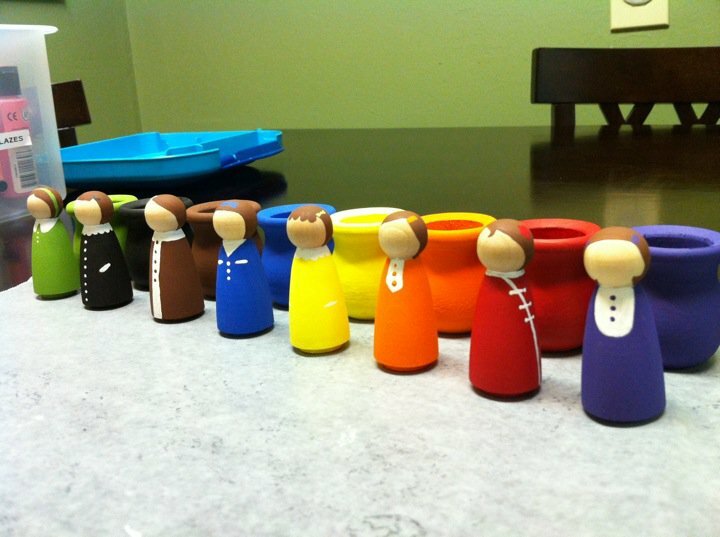 Sealed and finished both sides. (The alphabet rocks only had the front sealed.) I also had a leftover drawstring bag from some game that bit the dust years ago, which made the perfect carrying bag for the number rocks. Cam helping Kai with numbers and letters. 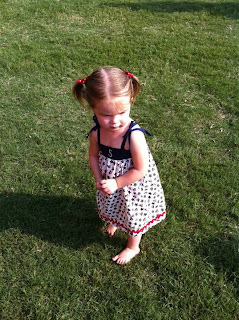 With all of that, I still wanted to get Scarlett's 4th of July dress made. I used a pattern from a tutorial I had used before from Lil Blue Boo. Added rick rack to the bottom and an embroidered "S" to the chest band (for "Scarlett"). Managed to get it done in time for the Fort Benning 4th of July celebration. Also made some hairbows to go with it.